I made a card using traditional Christmas colors. I colored her in Copic Sketch Markers on Neenah Paper. I had too much of a blast with Shabby White Frantage. 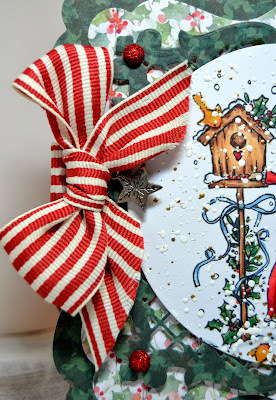 My papers are also from Wild Rose called Annabelle's Christmas. 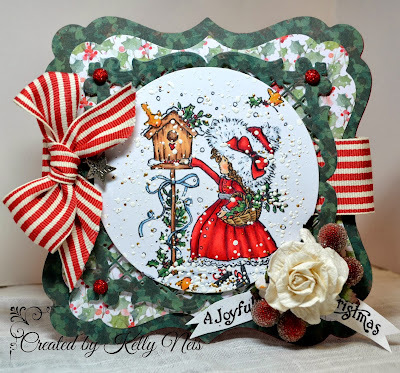 I used a Go Kreate die Frilly #2 for the base of my card. A rose and berries from my stash and the sentiment is from Magnolias newest Collection. My ribbon is from Stampin Up and a charm finishes off my card. Thank you for being here today! I enjoy reading all your comments. To enter our new Challenge please go to the 7 Kids Challenge Blog here. Wow Kelly this will get you in the mood for Christmas. I love your colors and Annabelle is a real doll! Great snow scene too! All of your layers and embellishments are Awesome! Another beautiful creation! What a sweet image! Your card is so pretty! 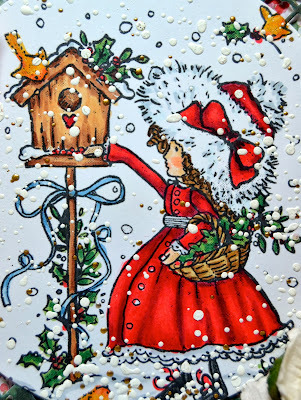 awwww this card is soooo cute, i love the sweet image and your coloring is great dear Kelly. Wonderful Christmas colors you have used and the Embellis, the Ribbon, Charm and Fran-tagé Look is gorgeous also. Hope you are doing well my friend. Ohhhh, soooo pretty, Kelly! I looove the snowy effect created by the frantage! Your coloring is outstanding...perfect papers and details! Oh, Kelly, this is gorgeous! Love this cute image, your coloring, and all that yummy frantage! The ribbon is just beautiful! Oh wow ! a beauty ! such a wonderful colouring ! so fab design ! Beautiful Kelly with such pretty colors - Love that ribbon! Looks like SU ribbon! I do believe you are the Frantage Queen! Sorry I missed your call. Hi Kelly! I know I've told you this on FB .. but wow wow wow .. gotta tell you again .. this is just absolutely GORGEOUS! I love this image, and you've coloured her up so BEAUTIFULLY!!! And that ribbon is soooo STUNNING .. I love it! Absolutely adorable Christmas card - the colouring is so exquisite... I especially love the bird house and the holly! Beautiful work, Kelly!